Skin problems, including fungus, can develop on all domestic pets. If your pet rabbit is suffering from itchy, flaky skin, fur loss or other health problems, then you need to consider fungus as a possible cause. Ringworm is the most common type of fungus that can afflict your pet rabbit. Ringworm can appear on your bunny's skin as a round, red lesion or a crusty, scaly bald spot. Ringworm is most likely to occur on your bunny's head, especially in the areas around his ears and face. Fungal dermatitis is a catch-all description for a variety of skin ailments that your bunny can suffer from. 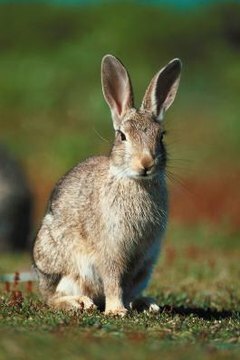 Your bunny can contract bacterial or fungal skin infections from a variety of sources. Symptoms of skin problems may include dry, flaky or itchy skin that may be red or inflamed. It can also include pus, fever, fur loss, scabs, lethargy and general signs of illness. Most fungal infections can be prevented through good care. Keeping your bunny's cage clean and supplied with fresh bedding can help prevent problems. Groom your bunny on a regular basis and make sure to take him to the veterinarian for regular checkups. Keeping your bunny's teeth and ears clean will also help prevent fungal infections from getting out of control. Avoid introducing your bunny to other animals who are sick or who you suspect might be sick. If you suspect your bunny is suffering from any type of fungus, you need to take him to the veterinarian for proper diagnosis and treatment. Your veterinarian in most cases will treat your bunny's fungus with an ointment or oral medication. Sometimes medicated baths or dips are also used.